Can I Play Gibraltar Lottery Online? Read Reviews! Let’s take a trip around the world. Do you know what our stop is going to be this time? You’ve probably guessed from the title of this article. Today, we are having fun with the national lottery of Gibraltar. While you may have never heard about it in the past, Gibraltar lottery is old. The Gibraltar Government Lottery came into existence shortly after the end of World War II. Today, it is still quite popular due to the pretty excellent odds of winning a prize. On top of that, the lottery is characterized by special drawings that produce much bigger prizes than the traditional ones. The first Gibraltar lottery drawing took place in 1947. The lottery was set up as a way to generate funds for the construction of new housing units for people who needed to be evacuated during World War II. The noble initiative quickly gained popularity, and 72 years later, the Gibraltar national lottery is still thriving. This is a passive game, which means that players don’t get to pick their numbers. There are 24 regular drawings per year, but additional ones could also be scheduled for special occasions. These additional drawings are the ones that have to contribute to growing the popularity of the lottery in Gibraltar. 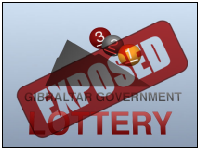 Is Gibraltar Lottery a Scam and Can You Play It Online? The short answer to the first question is no; the Gibraltar Government Lottery is not a scam. A lottery that has been around for 72 years has undoubtedly managed to establish its popularity and authenticity already. This is a national initiative under the management of the local government. Gibraltar has rules that guide the operations of the lottery and the performance of the entity responsible for scheduling, issuing tickets, selling those and distributing prizes among the winners. Gibraltar’s lottery takes place under the management of the national Lottery Treasury Department. There’s also a national Government Lotteries Regulation from 2006 that sets the regulatory framework for gaming. You have no reason to worry about the purchase of a Gibraltar Lottery ticket. There isn’t a way to be scammed. We have done some thorough research about fraud schemes utilizing the name of the national lottery in Gibraltar. At the time being, there aren’t such schemes to be found. As far as playing Gibraltar Lottery online goes, we will take a more detailed look at the opportunity in one of the coming sections. Since the game is described as a passive type of lottery, acquiring tickets and testing your luck is a simple endeavor. Gibraltar Government Lottery has 24 standard drawings per year. The cost of a ticket in one of the regular drawings is 10 pounds. In addition, there could be special drawings announced for some national occasions. Because the prices are going to be higher, the ticket price goes up to 20 pounds. Drawings typically take place every other week. In a standard year, there will be three special events, but the numbers could differ. For each regular drawing, there will be 20,000 tickets issued and sold and 23 winning numbers drawn. The Summer Bumper Draw is one of the special occasions that have 25,000 tickets. Gibraltar Lottery’s Christmas drawing is the biggest and the most impatiently anticipated event of the year. It comes with special prizes – 25 numbers are drawn each Christmas and the size of the jackpot increases. Because of the high interest, the Christmas drawing is the one that has the biggest number of tickets printed – a total of 50,000. These are once again available for 20 pounds. Additional special drawings may be organized and held throughout the year. Information about such extra chances to win will be provided via the lottery’s official website. Let’s take a look at the standard drawing first. There are 20,000 tickets and one top prize. This means that your odds of winning the biggest award are one in 20,000 – exceptional statistical probability in comparison to what other national lotteries have to offer. The maximum prize is 100,000 pounds. Because players don’t choose numbers and these are pre-printed on the tickets, there will always be a winner. As a result, the Gibraltar lottery does not feature jackpot roll-overs. There’s a second prize of 10,000 pounds and third prize of 5,000 pounds. Also, Gibraltar’s lotto produces various minor prizes for each regular and special drawing. These come in the range from 500 to 10 pounds. The total prize amount for a series of 20,000 issued tickets is 153,990 pounds, and the number of awards handed out to the players reaches 2403. Summer Bumper Draws, as well as the other special drawings, come with higher top prizes that start at 250,000 pounds. The Christmas draw is the one recognized for the biggest prize ever – one top award of one million pounds. Before 2017, the Christmas top award was smaller. In an attempt to increase the attractiveness of the Gibraltar national lottery, however, the government announced a change in the rules and an increase in the top prize. What’s interesting to point out, however, is that one of the two Christmas top prizes available after the introduction of the change has not been redeemed yet. As of the end of January 2019, there still isn’t any information about the person who won the 2018 Christmas drawing. The reason for the mystery is simple – the winner hasn’t come forward yet. The 2018 Christmas drawing took place on December 18, 2018. A winning ticket number for the top prize was drawn, and it was 93524. The ticker remains unclaimed, and the mystery engulfs just about everyone in Gibraltar. Can You Play Gibraltar Lottery Online? The Gibraltar Government Lottery isn’t a traditional kind of digit-based lottery game. Players do not have the freedom to pick their lucky numbers from a pre-determined pool. Instead, the government issues a limited number of tickets for every single drawing. These tickets are only available for purchase via authorized retail venues. Gibraltar lottery does not have an online ticket buying option available. If you want to get a ticket, you will have to be on the territory of Gibraltar when the respective drawing is taking place. Foreigners are free to participate in the lottery, and there are no nationality limitations. It’s also not possible to buy Gibraltar lottery online tickets via a web-based lottery agent. There is no digital platform supporting the local game. Players can start making prize payout requests on the business day following the date of the drawing. They have six months to come forward and request an award. There are no taxes imposed on lottery prizes in Gibraltar. The sum being advertised is the exact one that the player is going to claim. This is yet another reason why Gibraltar has become so popular among lottery lovers. Estimates suggest that the annual spending on lottery tickets per year reaches an average of 4.5 million pounds! Would you mind rating Gibraltar Lottery? Gibraltar’s Government Lottery is a lot of fun for various reasons. It’s a laid-back, passive opportunity to test your luck and to win a pretty impressive prize eventually. If you’re not happy with the regular drawings, numerous special events provide additional possibilities. If you’re looking for the world lotteries that have some of the best odds out there, you’ve come across a great opportunity. Gibraltar lottery has a well-established history and massive popularity. The special drawings are worth waiting if you’re interested in higher payouts.